64GB Extreme Pro CompactFlash Memory Card (160MB/s) is rated 4.8 out of 5 by 340. Rated 4 out of 5 by Juan A. from Fast and highly reliable I really love this card; fast and durable. The only thing I've found is that they don't are as fast as advertised; you have to understand they test this cards with particular equipment and NOT with your every day work devices. I purchased two, and they both max out at 98 to 105 mb/s with the Blackmagic app and a usb3 UMDA 7 reader... That's why I gave 4 stars. It works just fine for ML RAW up to 1080/24p and you can get decent 60p resolutions. I've done 1080/30p but it's not that reliable nor consistent. If you're looking (IMO) for the best CF cards money can buy, just add to cart. Rated 1 out of 5 by GregoryOfManhattan from failed in the field failed in a 5D3 while shooting in Tanzania. 5D mark iii had been serviced by canon days before and was running latest firmware version 1.3.3. After clicking to record some video, camera reported error saving file, then when I tried again it reported card corrupted. Lost some landscape photos of Mt. Kilimanjaro. Weather was humid and not too hot, low 80s (less than 30). Couldn't recover with Data Rescue software. Camera worked flawlessly with Lexar 1066x and Komputerbay 1000x 64gb cards for the next 2 weeks in East Africa - recording over 1000 photos and videos with no errors. Do not recommend this SanDisk 160MB/s card. It feels like the manufacturer is using customers for QA. Card was picked up from B&H on 9 Nov 2015 and failed on first use 15 Nov 2015. Rated 5 out of 5 by Ryan A from Fast and reliable! I use the Sandisk 160MB/s 64GB Extreme Pro CF card in my D800 paired with a 95MB/s SD card backing up in the secondary slot. I shoot weddings primarily and saving to RAW files and when you're using the D800 you really need the fastest card with as much space as possible when shooting multiple frame bursts in moments that cannot be repeated. Having said that, even though most of my shots during a shoot have enough time between each photo to not really need this card. It gives you a lot of confidence knowing that when something spontaneous happens that you won't hit that wall where the camera's buffer is full waiting to write to the card. Do yourself a huge favour and invest in the fastest memory cards from reliable brands like Sandisk. You owe it to your clients to make sure you don't miss those crucial moments. Rated 5 out of 5 by brasc from Seamless performance so far Eight months ago I took a bird workshop and came prepared with four 16 gig cards. We were fortunate to have great bird activity and I wound up with not enough memory. I was lucky to be able to buy two more 16 gig cards and thought that would do it. Things got even better the next day and I ran out of memory AGAIN. So, as soon as I could, I bought two 64 gig Extreme Pro cards. I shoot all day now, usually without having to change cards, and with these blazing fast write speeds I have never yet had to wait for buffering to catch up, and I'm shooting at 6 fps more often than not. Worrying about memory just doesn't exist anymore. This was a good decision. Rated 5 out of 5 by not hipster from MAGIC LANTERN FULL HD RAW This is only one the few CF card out there that can record 1080p RAW with Magic Lantern. Sandisks are pricey but very reliable from my experience and consistent. The Lexars are good but I've read a few reports they die after a year. Don't even go the Komputerbay route. Its too much of a gamble for me. I want to go out and shoot stuff not do benchmarks. If you are going to shoot full HD raw video with magic lantern, this is the card to get. Not worth the time to cheap out. The only con with this card is the price. I can get 256gb SSD for the price of this CF card. Ugh. Rated 4 out of 5 by Charles from 64mb issues with Nikon D810 camera I bought an Nikon D810 camera along with a 64gb card here, and I had to return the D810 because there were issue with the camera (or maybe the card). The camera stopped working. I changed CF cards to see if it was the card, but it didn't change the camera not working (err problem). Then I got a replacement D810 camera, used the same 64gb card, did fine today taking photos, but upon uploading, the card quit uploading half way through. Now I'm thinking maybe the card is bad too. My nikon D4 says the 64gb card is not able to be read. First time my scandisk cards had an issue. I will send in for replacement since I just bought the card, hopefully scandisk will replace it. I still like the cards, but this one was a dud, which is why I'm generous in giving it a 4-star. Rated 5 out of 5 by Pamira Bezmen Photography from fast. large. reliable as always. My Nikon D800 eats up a ton of memory fast. Photographing babies, kids, and sometimes having back-to-back sessions, I worry about running out of CF card memory while shooting. 64GB SanDish is a fast card. Works just as well as all the previous SanDisk CF cards I've owned and used for years. Pricy but if you know you'll need multiples of 16GB cards or 32GB cards, you may as well have a 64GB card in your camera. (but still always carry a back-up!) Especially if you will be on the road for a few days, you will need all the storage you can get in one card. Rated 5 out of 5 by G. Alan from Reliability I shoot a great deal of RAW imagery using a Canon 5D Mark III, from landscapes where set up and timing can be everything, to conferences and special events where available time is limited, lighting conditions can be less than optimal, and response time must be fast. ?So the last thing I want to worry about are my memory cards. ?And this card has never been a source of worry. ?Reliability is everything! ?Honestly, I have been using SanDisk cards for years and they have never failed me. ?Perhaps I'm just fortunate, but it's a fact. ?And the Extreme Pro has been no exception. ?I'll be heading for Scotland this summer, and you can be certain that this card (and a few other SanDisk cards) will be making the trip. This is a perfectly natural and simple question. Unfortunately, it is not a simple answer. That is because other information is needed such as the camera model, the camera's bit rate, and the FPS rate. However, to give you at least an rough idea, 64GB of 4K in Cinema DNG RAW should give you about 10 minutes. So that we may best assist you, please email us at provideo@bhphoto.com. Hi! we are great instreasting in the CF card, may i ask some question as follows before we order them. May I know how long warranty of the 64G CF Card? if we find the there are some defect in the CF card, how to deal with it? our location is taiwan, if we buy 10 piece, have any discount on CF? how we need to pay for freight free 10 pieces of CF ? Yes, the SanDisk 64GB Extreme Pro is compatible with the Canon 5D Mark II. The D800 is capable of shooting 4 frames per second. Shooting in RAW, that 320 MBs/second. The D800 can handle just about any high performance card. Can I use the 64GB Extreme Pro CompactFlash Memory Card (160MB/s) by SanDisk for Camera Canon 1dx Mark II? I have been using this CF in my Canon 1Dx for over a year without issue. Cannot format 64GB Extreme Pro in Canon 7D. When I try to format the card I get the error message: Card cannot be accessed. Reinsert/change the card or format card with camera. Any suggestions? Haven't had any problems using it with my 5D iii or canon xf300. Can you possibly try another camera? I don't think it's possible to put the card in backwards. Or it could just be a bad card. Maybe you can go to a camera store to use there camera just to format. 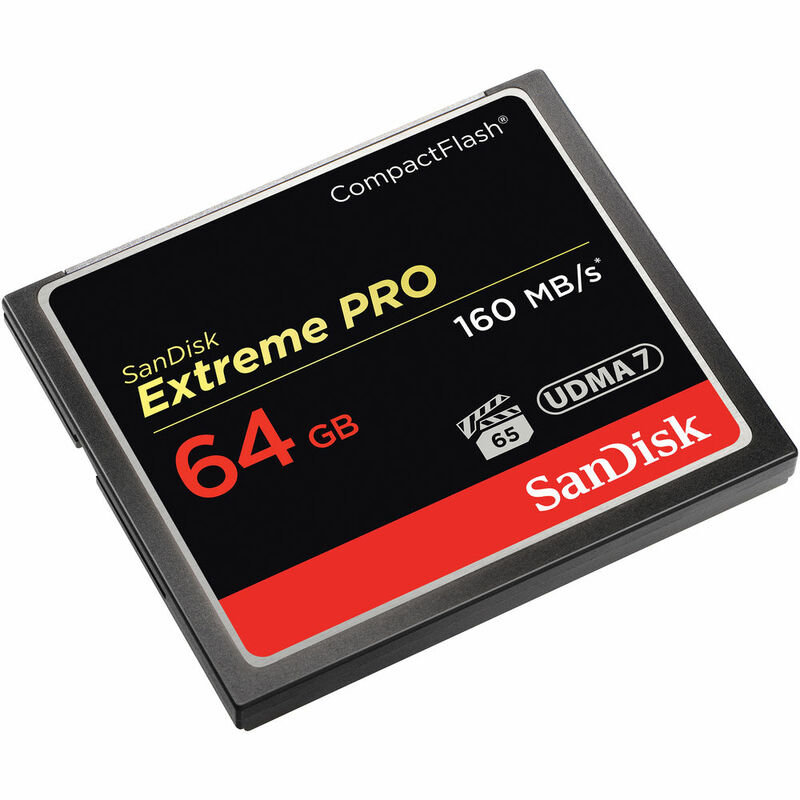 Can I use the 64GB Extreme Pro CompactFlash Memory Card (160MB/s) by SanDisk for Camera Canon 1dx mark2? Yes. I have used Sandisk Compact Flash for the last 15 years without a hiccup. Does this card work with the Nikon D300? 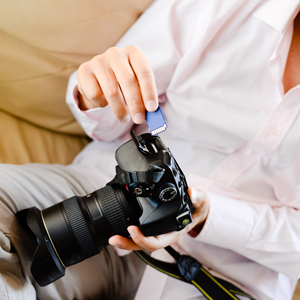 If not, which is the largest capacity and fastest card that can be used with the D300? The add says it's a Solo 3DR with pre-installed gimbal, but then down below, it says it does not come with a gimbal. Please clarify.